RSVP Required - Over half of TV consumers today use their mobile devices while watching TV (Pew Research, http://goo.gl/dkbXf). With the attention shifting away from the big screen, new ways to keep TV viewers engaged are necessary. In this workshop we will teach you the skills to save the TV and the couch potatoes. We will cover software techniques required to build amazing mobile + TV experiences, relevant standards, and platforms that enable these experiences in a cost-effective, scalable and profitable way. In our workshop, you will learn to build mobile and TV presence for a fictitious content network from the ground up in one day. You will start your day by creating fun video content, then syndicate it to YouTube, build a mobile and Google TV experience around it, and integrate analytics as well as monetization support. By the end of the day, you’ll feel like the media mogul you deserve to be. Basic experience with Android development. 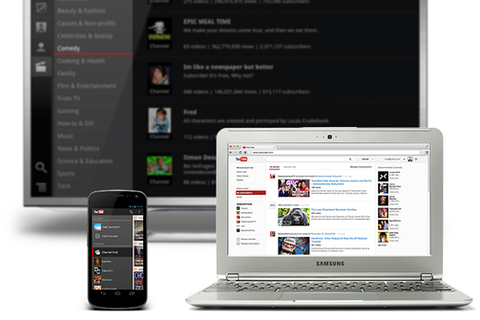 Some experience with GoogleTV development helpful but not necessary. 1. Bring a laptop and an Android mobile phone running Android 2.3 (Gingerbread) or later. To RSVP your seat for this workshop, please click on "Sign in to RSVP" in the upper right location of this page. You'll need to sign in using your SXsocial login information. Horia Ciurdar has been working at the intersection of YouTube and mobile for the past five years. He currently leads the teams that build YouTube's apps for Android and iOS. Jarek is a YouTube Developer Advocate and his focus is helping partners implement amazing applications using YouTube APIs. Les is a Staff Developer Programs Engineer for Google TV. He works closely with developers, writing sample code and helping them understand how to bring rich, compelling apps to the Google TV Play Store. As an eclectic developer, Les has worked on at all levels including hardware drivers, neural networks, accounting and databases for small businesses, solar energy systems, spreadsheets, image processing, electrical power systems monitoring and very smart websites. He's found that making things fast is an exponential benefit for users - faster things often have greater battery life and it tends to delight users, even if they don't understand why. Visible projects: AirPort wireless networking, helped drive the Core99 chipset through the Apple product line; the Newton printed handwriting recognizer; Full Impact spreadsheet engine for Ashton Tate; distributed multi-processor OS for Motorola (Computer cX); a flood management telemetry system and monitoring of solar housing for the TVA; a fail-safe system for Boeing Energy Systems. I’m part of the Developer Relations team at Google - we help developers make incredible things on Google technologies. I lead Developer Relations for Project Glass, building technology that’s there when and where you need it but doesn’t get in your way; as well as Google TV, helping developers build for the best screen in the house. While at Google, I’ve worked on Android as well as our maps, ads and commerce developer products. Previously I worked as a software engineer and consultant at Accenture, Random Walk Computing, CSC and Oracle. I call San Francisco, California home and in the winter can be found snowboarding in the Sierras. There are 18 seats available.